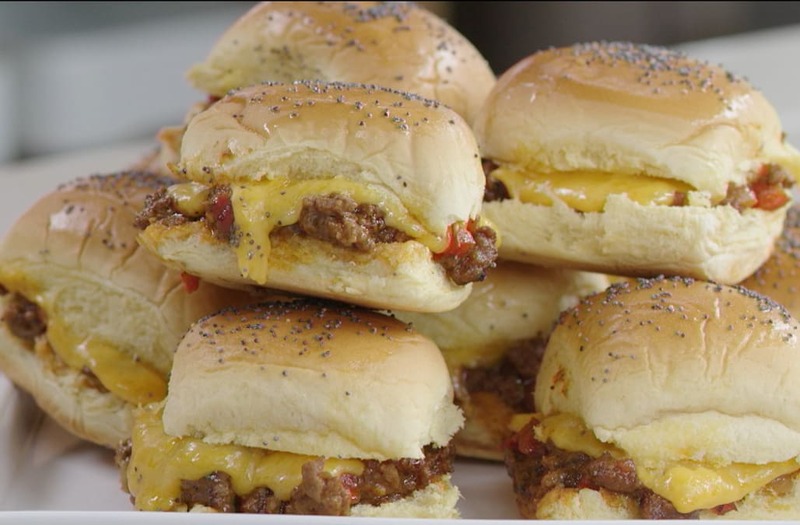 These cheesy Sloppy Joe sliders are the perfect snack for your next party! Check out the recipe on Best Bites! Heat a Dutch oven over medium heat and add the butter. Once melted, quickly add the onion and stir occasionally until translucent. Add the peppers and garlic and stir occasionally for 1 minute then add the ground beef and break it up with a wooden spoon, stirring it all together. Allow to cook for 3 minutes, stirring occasionally. Add the brown sugar, mustard, Worcestershire, liquid smoke, chili powder, and paprika. Stir for 30 seconds and then add the ketchup and vinegar. Allow to cook for 5 minutes, season to taste and serve or cook up to 1 hour on low and then serve. The longer it cooks the better the flavor. Scoop onto buns that have been brushed with butter. Place the bun bottoms in a baking dish and fill each bun half with meat and a pile of cheese. Place the lid on each. Cover with foil and bake for 15 minutes or until the cheese is melted. Remove the foil and bake 2 more minutes to toast the buns.